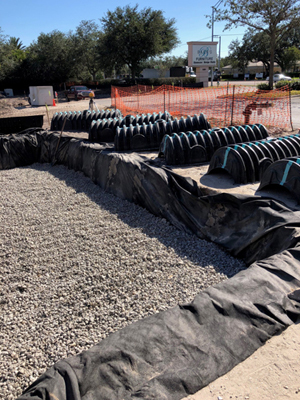 A stormwater management system designed for a new convenience store in Sarasota, FL, required a sophisticated and elaborate approach. When it was completed earlier this year, the complex system resulted in huge money and time savings for the property owner, which will enable the store to open this fall. The project centers on the construction of Wawa, a 24-hour convenience store. Gates Construction serves as the general contractor for the Philadelphia-area based chain, which is expanding aggressively in The Sunshine State. The chain has more than 700 stores, mostly in mid-Atlantic states, and opened its first store in Florida in 2012. More than 200 Wawas are expected to be open in Florida by 2022. The site for the Sarasota store posed several challenges for Tonitis and his Elite Development Services team. The store shares the parcel with a furniture store, a long-time tenant at the site. The store needed to remain open during construction, which dramatically reduced the imprint in which Tonitis and his team could store and utilize equipment. Florida’s topography created additional design problems. The groundwater is close to the surface, and the site included several ponds that needed to be filled in so that engineers could provide adequate parking for the store. More problems emerged when crews started to dig lines to install the system. The underground electrical vaults proved particularly troublesome — and dangerous. There were also fire suppression piping and fittings that forced Tonitis and his team to adjust the system as they encountered the encumbrances. The system that Tonitis eventually installed was one of the most elaborate he has ever encountered. Working with a computer-assisted program on CULTEC’s website, Bohler Engineering designed a system that included 21 sections of various sizes. 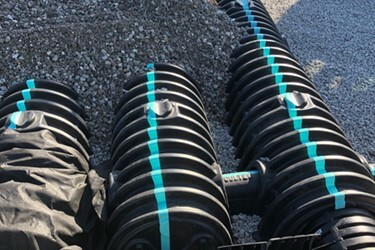 While most stormwater systems are long, linear systems that are stitched together with feed connections, the design for the Sarasota project required a complicated map that carries stormwater away from the property in smaller, bite-sized positions. The complex design included 1,023 Recharger 180HD chambers. They measure 7.33 feet (2.33 meters) and are 36 inches (914 millimeters) wide. They offer 163 gallons of storage, or 3.45 ft3/ft. The mid-size chamber is typically used for installations with depth restrictions or when a larger infiltrative area is needed. In all, Elite Development laid down 116 rows to manage nearly 23,900 cubic square feet. The system was topped with 2,178 tons of crushed stone. The store is expected to open in October 2018. The first Wawa opened in 1964 in Folsom, PA, a suburb of Philadelphia. It is known for its touchscreen ordering and deli-style sandwich counters. The business ranked 34th in the Forbes list of private companies in 2015 with total revenues of $9.68 billion. Wawa employs more than 30,000 workers. Thomas Renner is an award-winning journalist based in Connecticut who writes frequently on construction, manufacturing and other trades.